Early this year, a toxic chemical spill on a north China’s river sent citizens of the downstream city of Handan, Hebei province, rushing out to buy purified water. Greenpeace responded quickly, sending a group to the site of the accident in Shanxi province, to carry out an independent investigation into the aniline leak. But the team found something even more concerning than the chemical spill: the pressure being placed on downstream water supply by the dense concentration of water-guzzling coal chemical plants. Zhong Yu, senior action co-ordinator from Greenpeace’s East Asia Office, said that, with limited water resources, industrial water consumption has led to an increasingly severe conflict of local interests. The Tianji plant in Lucheng , Shanxi, the company responsible for the aniline spill, is a huge consumer of local water. 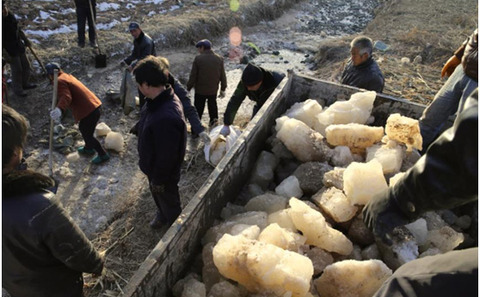 Its supply comes from the groundwater of the banks of the Zhang River and its annual water consumption is more than 17.8 million tonnes, the equivalent of 100,000 households of three over a period of a year. On top of this, the coal chemical plant discharges more than 6.1 million tonnes of contaminated water annually. Greenpeace’s findings show there are more than 100 coal chemical plants distributed over the upstream region of the Zhang. In China, 2.5 cubic metres of groundwater is needed to extract one tonne of coal; another 2.5 cubic metres to wash one tonne of coal; and 7.6 cubic metres for every tonne of coal used to generate electricity. Converting one tonne of coal into oil or olefins as part of the coal chemical production process uses 10 to 15 tonnes of water. Large-scale coal chemical plants can consume 2,000 to 3,000 tonnes of water per hour. The Changzhi City government recently ordered 112 coking-based chemical plants in the Zhuozhang river basin to suspend production while they investigate related hazards, according to local media reports. Back in 1992, the State Council established a new authority tasked with planning and management of water resources on the upper Zhang River. Unfortunately these measures have not managed to curb the “water guzzling” tendency of the coal chemical plants. The south-eastern region of Shanxi, where Changzhi is located, is one of the three coal chemical bases set out in the province’s 12th Five-Year Plan. It is also upstream of a number of rivers. It is a region heavily reliant on river water, and the coal chemical industry with its huge consumption of water and high risk of pollution, poses a serious threat to downstream neighbours. A glance at a map of China shows the south is richly endowed with water, while the north is lacking. Shanxi, Shaanxi, Inner Mongolia, Ningxia, Xinjiang and Heilongjiang are six provinces and autonomous regions with 9.98% of the country’s water resources and 79% of the country’s coal reserves. The 12th Five-Year Plan set up most of the coal power bases in the north, north-west and north-east of the country. Based on current figures, it is estimated that the 2015 development of the coal industry in the west will consume up to 10-billion cubic metres of water, approximately a quarter of the annual flow of the Yellow River. Its average daily water demand will be a fifth of the daily amount consumed in the whole of China in 2009.